AOMEI Backupper is effective enough to make your important files immune to adverse ransomware impact and critical hardware failures. Data backups are now more relevant than ever. In an online world with crypto ransomware on a rampage, investing in a wise backup strategy is the perfect tradeoff between data intactness and the risk of losing valuable information due an increasingly probable cipher-backed virus onslaught. Aside from that, no standalone computer or enterprise network is bulletproof against hardware failures that may lead to irreversible file destruction. The utility called AOMEI Backupper can bridge the information integrity gap in either one of the above scenarios. It allows backing up individual files, folders, disks, partitions or dynamic volumes in a few clicks. To this app’s credit, it can also back up the entire operating system by leveraging the Volume Shadow Copy Service (VSS) so that you needn’t even shut down the machine or interrupt your work with files. 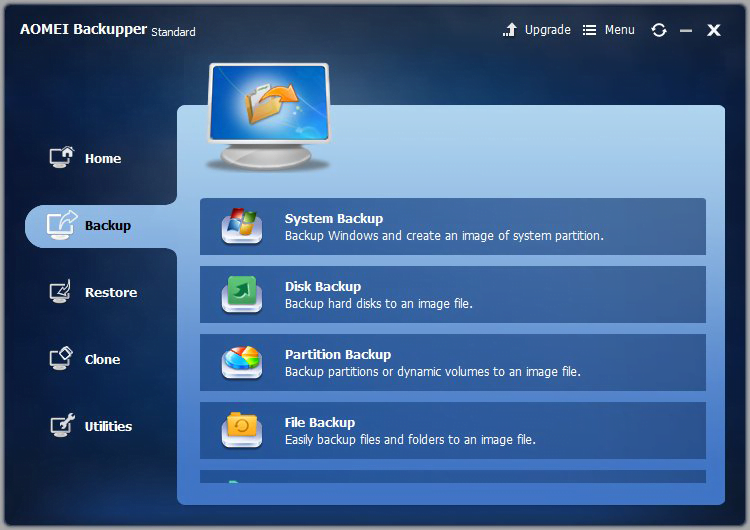 For each backup option, the utility provides extensive settings that can be toggled within a single interface with tabs. You can configure the preferred compression level, specify the mode of splitting large image files, opt for exact backup or intelligent sector backup, and choose between using VSS or AOMEI’s native backup technique. Furthermore, comprehensive task scheduling is certainly on the plus side of this application as well. It enables you to have the app perform full, incremental or differential backup on a daily, weekly or monthly basis, or upon event triggers such as user logon or system startup. On top of that, the tool makes it easy to encrypt backups, sync files, create bootable rescue media, and clone a disk, partition or system on the whole. As counterintuitive as it may appear, such an advanced backup program boasts a streamlined interface that’s absolutely a no-brainer to use. We have scrutinized the usability and efficiency of AOMEI Backupper from different angles for you to get the big picture. The installation process is streamlined to the extent where you make a few clicks and it’s done. Quite predictably, the setup wizard for AOMEI Backupper first displays a screen where you can opt for the default location to install the software or define a custom file path. An additional technicality is to accept the EULA if the terms are okay with you. Then, the installation proper commences. It takes less than a minute to complete, so the wait is nearly imperceptible. When done, the tool opens up an “Installation Successful” web page with some useful product information, including resources for online help. The GUI of this application is very clean and intuitive. The developers have obviously done a great job fitting a bevy of features and controls into a single pane that appears somewhat simplistic at first sight. 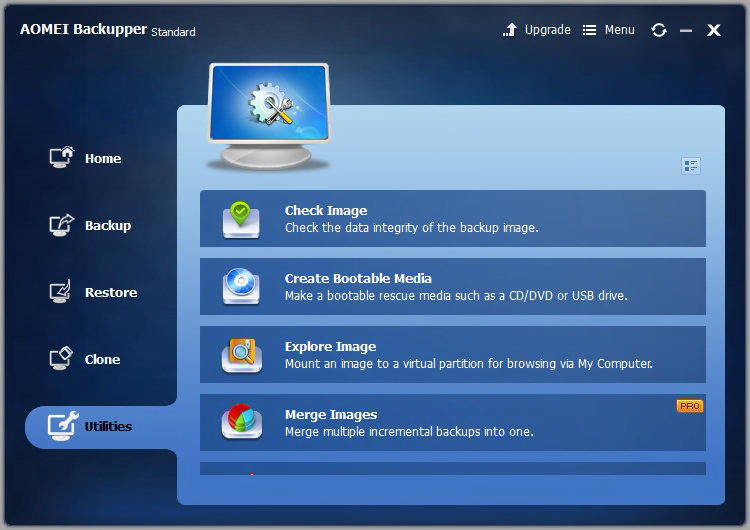 The left-hand section of the interface contains buttons for Home, Backup, Restore, Clone, and the Utilities components, while the entirety of program settings are accessible via the Menu icon in the upper right-hand corner. 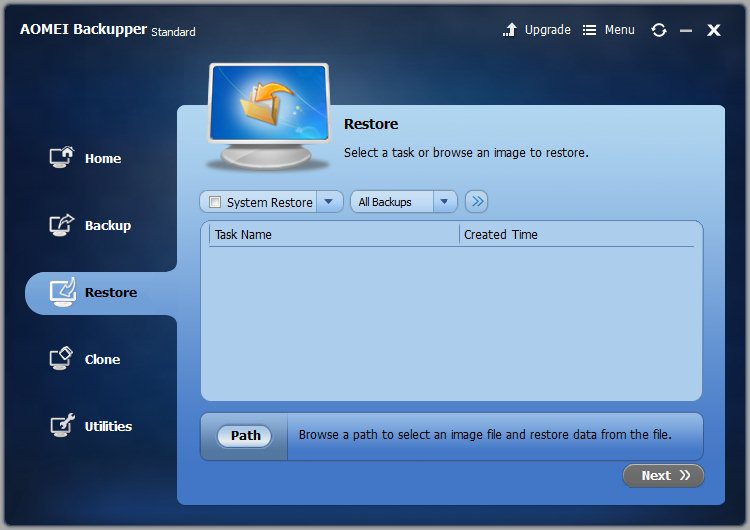 The first thing you see on the GUI after AOMEI Backupper has been installed is the blank Home section containing a large clickable “Create New Backup” button in the center so that you can start your backup routine right away if you’re up to it. When clicked, this icon leads to the Backup pane providing the following self-explanatory options: system backup, disk backup, partition backup, file backup, and file sync. Every backup you make is then displayed within the Home pane, with indications of its name, the date, and additional backup management tools, including the restore functionality and scheduling feature. A small shortcoming in terms of usability is that the tool uses Windows native file/folder selection dialogs rather than a file viewer of its own. This hallmark sign may tangle the process of creating backups with ramified data hierarchy but shouldn’t cause any difficulties with simpler backup tasks. Another thing we noticed is that this product lacks a backup pause function, which means that you can only cancel a task altogether without the ability to resume it later on. These nuances laid aside, the solution works fairly fast and allows for extensive customization of the backup routine. 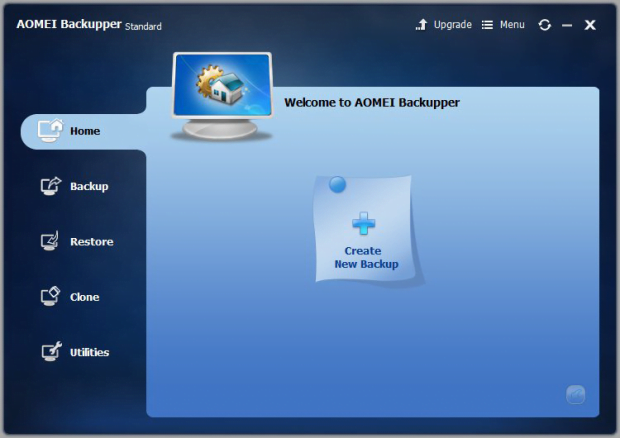 File backup is one of AOMEI Backupper’s essentials. It allows you to create reserve copies of Office files, documents, images, videos, games and programs currently stored on the hard disk, on network, or network-attached storage (NAS). It’s possible to back up files to an external hard drive for greater data integrity. 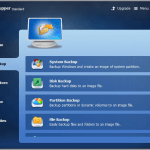 The system backup feature makes it easy to secure all contents of the system drive. This way, you can back up Windows operating system, installed software and system preferences. Essentially, the tool creates a full image of system partition, including system files, configuration settings, boot files, hardware drivers, etc. The gist of disk backup provided by AOMEI Backupper revolves around creating a disk image that’s a precise copy of a PC’s hard drive. This feature helps avoid data loss in case of a malware attack, disk failure or critical system malfunctions. Furthermore, it is invaluable for system migration from HDD to SSD. As the feature’s name suggests, partition backup enables you to create an exact copy of a specific disk partition rather than the entire hard drive or system volume. Essentially, the idea is to compress a partition into one image file that allows for restoring all contents in the future. Incremental / differential backup enables you to back up all information that was changed since last full or differential backup. In other words, this routine secures all data altered or added after a previous backup was completed. It skips files that didn’t undergo any modifications, thus reducing the time needed to deploy the task. File sync is an option that lets you easily synchronize files or folders on different machines automatically. This functionality does the trick when you need to finish some work at home beyond working hours or transfer data from one computer to another. It’s also great to know that file sync can be scheduled to run automatically at predefined points in time. The importance of backup scheduling is hard to overestimate. With AOMEI Backupper, you can define the backup job to run at a certain time daily, weekly, monthly, upon different event triggers (Professional Edition only), or at specified intervals. This feature makes the backup routine completely hassle-free so that you don’t get distracted from your regular computer usage. 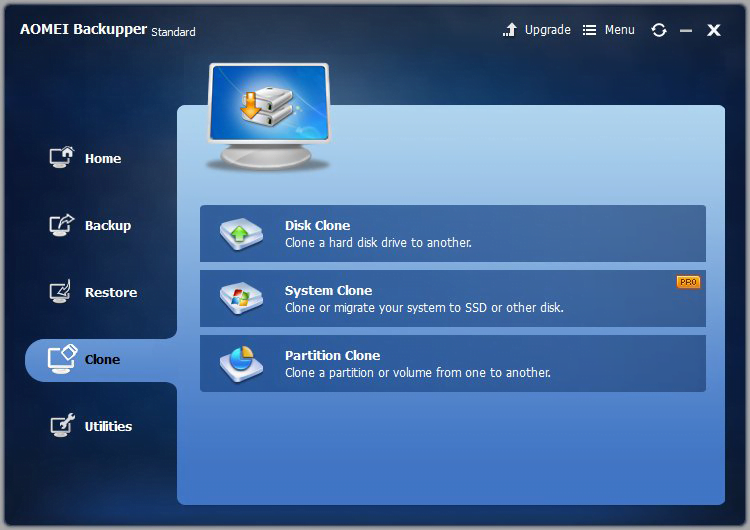 The Clone function lets you clone a hard disk drive to another, clone or migrate the system to other disk, or clone a partition or volume to another one in a few clicks. Be advised the System Clone feature is only available in Pro version of the software. The tool being reviewed goes equipped with command line backup option through AMBackup.exe process. It allows you to make backups using command line interface or by means of a batch file. This method is particularly helpful when you need to make unattended backups or different backups for multiple data components at the same time. 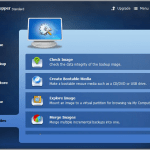 The application also enables you to make Windows PE / Linux bootable media (CD, DVD or USB). If a system crash occurs, you can use this type of external boot device to launch the operating system and do the rest of the troubleshooting without losing any data. Backup speed by AOMEI Backupper is on the order of 1 GB per minute. This benchmark is above average but not the highest across the board. The data compression rate is configurable – you can select no compression at all, opt for the default compression level (about 10%) or set it to a maximum rate. Be advised the latter will take much more time to complete than the recommended level. The data restore process is about two times faster than the backup, reaching a rate of 2 GB per minute. Of course the required amount of time is a function of data volume that the tool has to process in every individual case. As a quick recap of the efficiency criteria, the backup, compression and restore speed by AOMEI Backupper should fully meet the demands of the average home user or enterprise. The links to all tech support resources are at your fingertips – the program’s GUI provides them in the main menu accessible via the apropos icon in the upper section. These options include Online Help, Tutorials, and the Support button proper leading to AOMEI Backupper Support Center. We recommend visiting latter as it is an all-in-one portal containing the entirety of useful references you might need: documentation (PDF version included), FAQs (purchase issues, technical questions, product upgrades), and the community forum. The vendor’s website also provides separate email contacts for technical support, sales and order, cooperation, and complaints. Customers can also use the phone order option 24/7, with one phone number for the U.S. and Canada, and one for international orders. 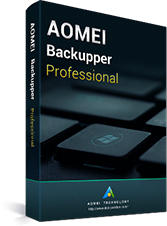 AOMEI Backupper is one of the most user-friendly backup solutions on the market. All of its controls are self-explanatory and easy to access, so people will little or no backup experience won’t find it hard to safeguard their data with it in a few clicks. To this app’s credit, it meets the highest efficiency criteria when it comes to backing up, compressing, restoring and syncing information. It can back up the whole system, a hard disk, a particular dynamic volume, or simply any file you choose. Furthermore, the utility boasts extensive task scheduling, all-embracing support, and its free “Standard” version goes equipped with a great deal of features. Although the backup and restore speeds aren’t the highest ones we’ve seen in this software niche, AOMEI Backupper is a competitive and very reliable tool to keep your data intact.